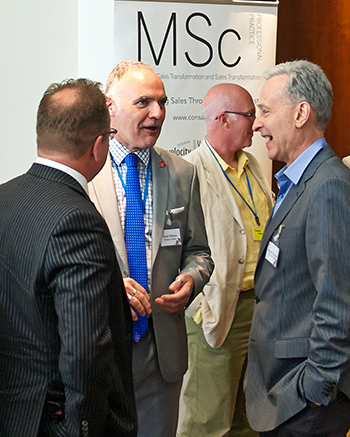 Consalia and Middlesex University hosted the tenth Global Sales Transformation conference at the London Stock Exchange last week. A hundred top decision makers from prestigious UK and international companies listened to talks from inspiring speakers including Vice-President and Global Head of Sales Enablement at Wipro Robert Racine, Vice-President Global Sales at Sony Mobile Communications Matthew Lang, Middlesex University alumnus and Principal Scientist with HM Government Security Sector John Ardis, and Global Head of Sales Transformation at Vodafone Stephen Cullen. Under the banner 'Towards Sales Excellence', the event was geared towards generating new perspectives on how to drive organisations to higher levels of performance through efficient transformation. Commenting on the event, Director for Corporate Engagement at Middlesex University David Williams said: "This has been another successful event bringing businesses and academia together to explore this essential area of work. "We have been delighted with the response from the professional sales community and look forward to continuing to develop and support the sector." Middlesex University has been working in partnership with sales specialists Consalia for many years and jointly they run the UK's largest in-house master's programme for sales professionals.